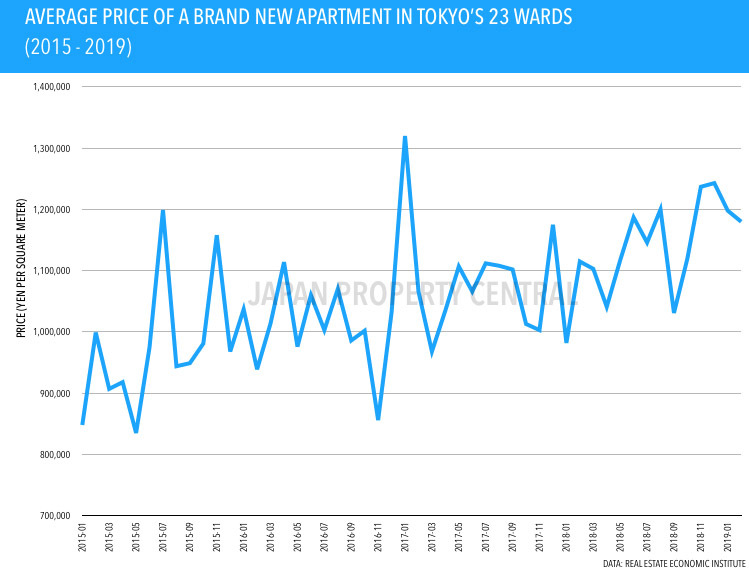 Credit: Japan Property Central using data from the Real Estate Economic Institute licensed under . The contract rate for the month was 65.6%, down 1.9 points from the previous month but up 0.6 points from last year. The average price was 62,840,000 Yen, up 2.5% from last year. The average price per square meter was 911,000 Yen, also up 2.5% from last year. 922 new apartments were supplied in Tokyo’s 23 wards, down 16.5% from last year. Kanagawa saw a 40.6% increase, while Saitama prefecture saw a 69.2% increase. The contract rate in Tokyo’s 23 wards was a healthy 72.0%, above the 70% level said to indicate balanced market conditions. The average apartment price was 78,410,000 Yen, up 8.6% from last year. The average price per square meter was 1,180,000 yen, up 5.8% from last year. Unsold inventory across greater Tokyo was 8,572 units as at the end of February, down from 9,040 units in January, but almost a third higher than the inventory at the end of February 2018. Data obtained from the Real Estate Economic Institute, March 18, 2019.